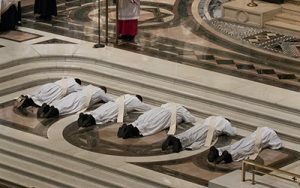 Holy Orders is the sacrament by which one is received into the ministry of the diaconate, priesthood, or episcopacy in the church. According to the Catholic teaching, the sacrament of Holy Orders is a divinely instituted structure of the church. If a person is interested in entering the seminary to study for the Priesthood or the Permanent Diaconate Program they should contact one of the priest who will assist them in receiving information and/or applying. For more information click here for the Archdiocese of St. Louis Vocations Office.